Visible satellite imagery and Quickscat indicate that a tropical disturbance is on the border of being classified as a tropical depression. Since yesterday deep convection has started to develop on the western side of a weak low pressure area. 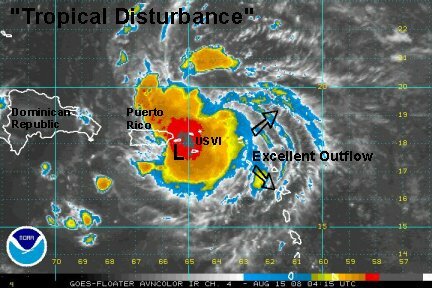 The disturbance is centered near 11.5 N / 43.6 W or about 1240 miles from the Leeward Islands. Forecast models take this system to the vicinity of the Leewards in the next few days then toward the Bahamas. 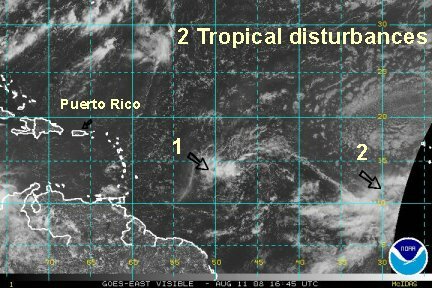 Interests in this vicinity should follow the progress of this tropical disturbance. Last edited by Caribbean Traveler on Fri Aug 15, 2008 4:07 pm, edited 4 times in total. Which will be the next depression? The first disturbance is near 13 N / 50 W or a little over 800 miles from the Leewards. Yesterday this disturbance looked more organized. The models still want to develop it some take it toward the Leewards or just north then to the Turks and Caicos before heading more south into Cuba. 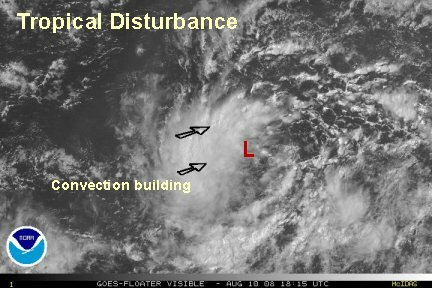 The second disturbance is in an envelop of deeper convection and centered near 11 N 29 W. The models also develop this one, take it north of the Leewards and recurve after that. It is still early with both of these disturbances, so the models may not have a great handle with them yet. 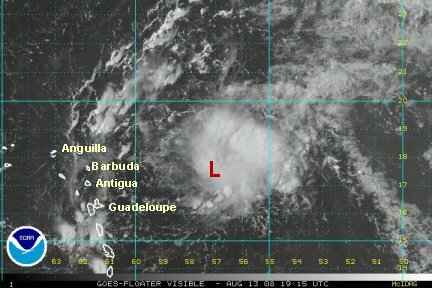 It appears that the disturbance center near 16.3 N / 51.4 W or about 640 miles east-southeast of the Leeward Islands is getting better organized and may be upgraded to a tropical depression this afternoon. Quickscat satellite still indicated an open wave earlier, but it may not be able to pick up an accurate reading under the deep convection where the center appears to be. There is a definite spin on the visible satellite, but is still not clear if this circulation is at the surface. Hurricane Hunter recon will be on site early this afternoon and we will know for sure. Forecast models take this system just north of the Leewards and then toward the Turks and Caicos. It appears that a ridge of high pressure will stay strong enough to force it farther west. All options are on the table at this point, including a visit to the U.S. We are being vague at this point 1) due to the fact that the forecast models need to know exactly where the center of the developing low is and 2) a very deep trough will be dropping into the central U.S. during a critical time period - late this week into early next week. If the trough is strong it will pump up the ridge forcing the tropical system farther west. If it is weaker, then the system may be able to recurve around the high offshore. Don't panic at this point. There's still a lot that can happen. Last edited by Caribbean Traveler on Wed Aug 13, 2008 1:06 am, edited 2 times in total. The recon data is in and it does not look like they found a low level circulation. The circulation is above the surface still. A more complete update will follow a litltle later. Last edited by Caribbean Traveler on Wed Aug 13, 2008 12:55 am, edited 1 time in total. The Hurricane Hunter recon plane investigated and only found a strong tropical wave. 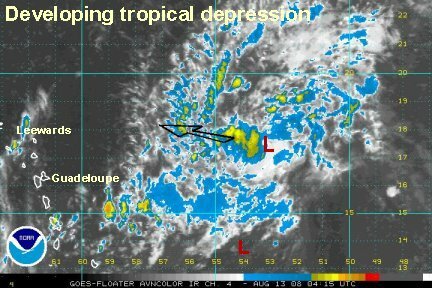 The difference between a strong tropical wave and a tropical depression is that a depression is actually a closed low. Visible satellite imagery continues to show a well defined circulation. Obviously, this is still not a surface low, even though a low is indicated on the 850 mb streamline analysis. The low is just above the surface and conditions appear favorable for development. 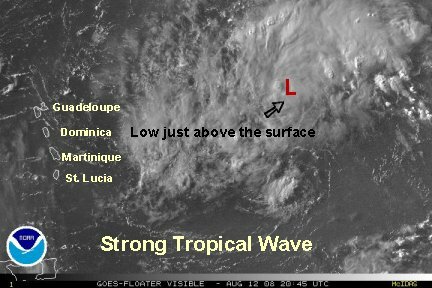 It is also interesting to note that the Quickscat indicated a strong tropical wave and not a closed low yet. The Hurricane Hunters will be returning tomorrow for another visit. The circulation with this system is centered near 17.0 N / 52.7 W or about 580 miles east of the northeastern Leeward Islands. This low should move north of the Leewards and then move in the general direction of the Turks and Caicos. Forecast models are also calling for development, but the forecast track spread is considerable. The spread is from south to Cuba to some recurving it east of the Bahamas. Several take it into the Bahamas. As mentioned earlier - there is uncertainty with the strength and timing of the mid-latitude trough in the middle of the U.S. late this week. Plus the models usually don't perform well when a true surface low hasn't developed yet. A very apparent circulation is centered near 17.3 N / 53.5 W. This is the mid level circulation that we have been following. Quickscat satellite through this evening did not show a surface low. That has now changed. A surface low has developed considerably farther south near 13.6 N / 54.0 W. The question is will the strong mid level circulation overtake the weaker circulation to the south? Until we know, all of the models are trash. They don't know either. We faced this same situation earlier this year with Dolly near the Yucatan peninsula. There was a mid-level circulation well to the north of the weaker surface low to the south. In that case the mid-level low developed into the dominate low. Look at the Tropicast picture below. You can see the difference between the mid level low to the north and the surface low to the south. Wednesday should be interesting. Hopefully we will know which low to key on by Wednesday afternoon. Since last night, the mid-level circulation has faded and the surface low has now become the real center of circulation. 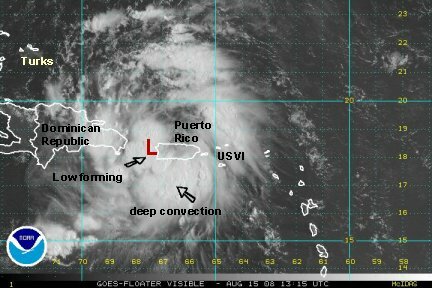 The relocated low is centered near 16.3 N / 57.0 W or about 280 miles east of Guadeloupe. At this point deep convection is building near the surface low with the whole northeast quad covered. A Hurricane Hunter and NOAA research plane will be on site early this afternoon. The forecasts models have shifted slightly north with the zone from the Florida straits to east of the Bahamas by Monday late or into Tuesday if it goes farther west. At this point it probably shouldn't be classified as a depression since the surface low looks weak and the wind shear is still affecting it. Conditions appear to favor strengthening in the next day or two when upper air winds aren't as hostile. Don't panic. There's still a lot that can happen. Due to a lack or organization earlier, the Hurricane Hunter and NOAA missions were cancelled. It appears that the system is just starting to get organized. The surface low appears to be embedded on the edge of the cloud mass. If this is the case, slow development is on the way. There have been no new model or Quickscat info to look at recently. The forecast track appear to be near the northern edge of the Islands for the next three days. 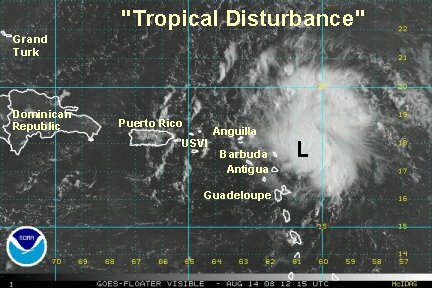 The disturbance is centered near 17.5 N / 57.0 W or a little over 300 miles east of Antigua and Barbuda. Moving west northwest. Showers will increase in the northeastern Leewards tonight. 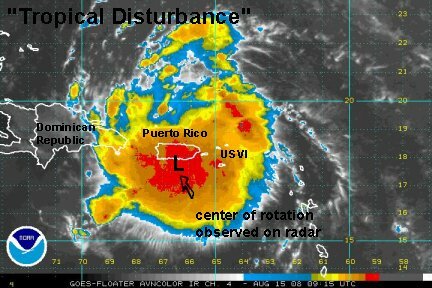 Satellite imagery suggests that the disturbance may have reached depression strength. It looks like the low level center may now be under the deepest convection. This is certainly the most organized this system has looked yet. At this time, the center is near 17.8 N / 58.5 W or about 215 miles east of Barbuda. It is moving west-northwest and should move just north of the Islands. Expect showers and squalls to increase from Antigua northwestward to Anguilla during the day tomorrow. Rain could be quite heavy at times. The USVI, BVI and Puerto Rico will be next to see the increase in squalls by tomorrow night. Conditions appear to be becoming more favorable for development. All interests in the northern Caribbean, Turks,Caicos, Bahamas and southeastern U.S. should monitor the progress of this system. 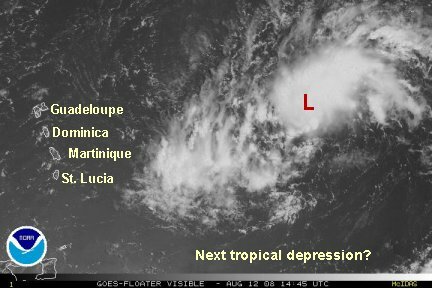 Satellite imagery shows that the tropical disturbance is now a tropical depression. There can be little doubt. NHC chose not to upgrade at the last advisory 15 minutes ago. They usually like to wait for a recon ( this afternoon ) or visible satellite imagery. I suspect they will upgrade at 11 am edt or may even put out a special advisory. 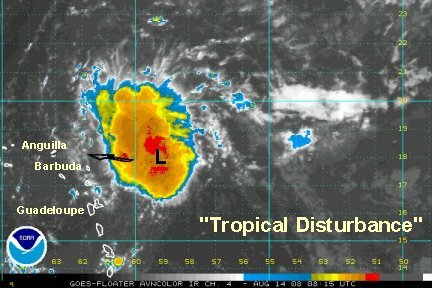 The "disturbance" is getting too close to the Leewards not to have taken action. Unfortunately the Quickscat satellite once again has a "missing data strip" over the tropical disturbance. That tends to happen when things are getting interesting. 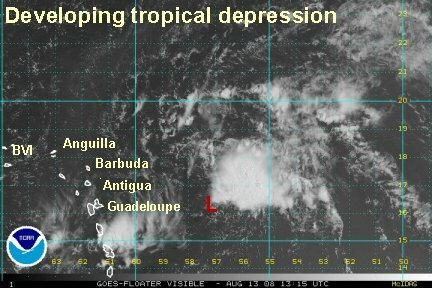 The disturbance that we'll call a depression is centered near 18.0 N / 59.8 W or about 135 miles east of Barbuda. It is moving nearly west at about 12 mph. (maybe just barely north of due west) This will carry rain squalls into Antigua, Barbuda , Anguilla today and toward the BVI's, USVI's and Puerto Rico by tonight. A ship report near the ciculation had a pressure of 1010 mb. The low is probably near 1008 at this point. NHC may have to go straight to tropical storm if this trend continues. The forecast models suggest that this tropical cyclone will move near or just north of the Islands and recurve through the Bahamas just east of Florida.....It looks like a tough forecast coming up. Interests from the northern Caribbean Islands / Turks - Caicos / Bahamas and southeast U.S. should monitor the progress of this tropical cyclone. for NHC to upgrade this to a tropical depression and probably tropical storm Fay. 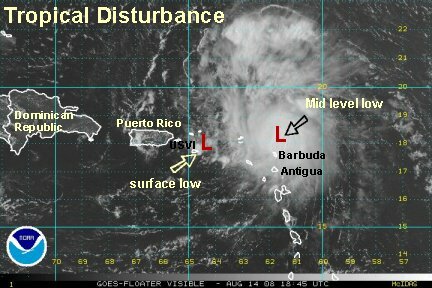 At 9:30 am edt the "disturbance" was centered near 17.8 N / 60.8 W or about 65 miles east of Barbuda. It is moving west at about 15 mph. Our previous estimate was a smidge too far north we think. The center now shows up nicely on the Leeward Islands radar. It will also be nice to get the Hurricane Hunter data this afternoon. Our guess is that they will go straight to a storm with this one. 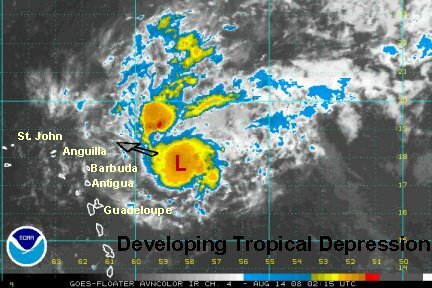 It looks like the weather will go downhill today for Barbuda first then Anguilla later this afternoon. New model data will be in this afternoon. The general track is over or just north of the northern Caribbean Islands and <i><B>possibly</b></i> recurve just east of Florida or in the Bahamas. Remember, don't panic, a lot can still happen. Hurricane Hunter, radar and visible satellite imagery show that the surface low is near 18.0 N / 64.5 W or just northeast of St. Croix. A very well defined mid level low is centered near 18.3 N / 61.5 W or a little north of Barbuda. The surface low will soon move into the mountainous region of eastern Puerto Rico. That may be enough to destroy or weaken the low considerably. The mid level low is well defined on radar imagery. This may become the new surface low center. Again as mentioned earlier, Hurricane Dolly went through this same process east of the Yucatan in the western Caribbean Sea. The mid level low became the dominate low. We think the mid level low will take over here also. Winds aloft have become favorable with good outflow in all directions. There was a deep convection burst earlier today that has eased just a bit. There is potential for this system to develop rapidly if the mid level low takes over. Since there is a surface low and heavy rain squalls, NHC still should be upgrading this disturbance. The effects will be the same as what a minimal tropical storm would produce. The general track is over or just north of the northern Caribbean Islands and possibly recurve just east of Florida or in the Bahamas. This is probably the most impressive tropical disturbance that we have seen in quite a long time. At this time, heavy rain squalls are moving through the Virgin Islands heading to eastern Puerto Rico. Flash flooding with mudslides are likely in the mountainous regions. The Hurricane Hunter is now investigating to try and find a surface low. Nighttime placement of a center is always difficult without visible satellite imagery. The radar seems to show a low forming between St. Croix and the southeast coast of Puerto Rico. The forecast models have shifted south some too. Some models take the system right over the northern Caribbean Islands, and others still just north and recurving over the Bahamas. As we pointed out earlier, the models won't be terribly accurate until they know exactly where the surface low is. One of the models a few days ago actually formed the low south of the Islands. It was the one outlyer so not much stock was put into that solution. Rain will become heavy in Puerto Rico tonight into Friday. The Dominican Republic will see the heavy rain move in Friday. The amazing story with this tropical disturbance continues. Cloud tops continue to cool as deep convection covers Puerto Rico into the USVI. The radar clearly shows rotation now just offshore of Ponce on the south coast. It will be interesting to see if the proximity to land will hamper the surface low development. It looks as if the circulation will emerge off of the west coast of Puerto Rico then finally develop later today. Flash flood warnings are in effect for the mountainous region of eastern Puerto Rico. Several inches are likely with 10" possible in the mountains of eastern Puerto Rico. Doppler estimates have been in the 8" or more southeast of Puerto Rico so far. The Dominican Republic will see rain becoming heavy during the day today. The forecast models all are now recurving this system through the Bahamas. The problem is that they are all initialized with the low north of Puerto Rico, which seems not to be the case. If the low is truly forming just south of Puerto Rico, then the track should shift a bit south. So this means that the models still can not be trusted for a good answer yet. It's possible that a low will form just west of Puerto Rico then move inland over the Dominican Republic, still hampering development. It will be critical on the exact position of the low since a tropical cyclone simply can not develop over land. This disturbance should be upgraded on the 11 am edt advisory. A surface is now apparent on the Quickscat microwave as well as a rotation noted on the radar imagery. The only question is, will NHC upgrade before it slams into the Dominican Republic today. There is a small window for it to strengthen before moving over land again. It also depends on how much land it moves over. It's possible that it may just clip the northern coast. We won't know the exact position until the Hurricane Hunters are back on station early this afternoon. Deep convection is visible near the center of circulation as well as to the south. Doppler radar estimates of 4" are noted on the southern part of Puerto Rico and up to 7" near the USVI. Heavier amounts likely fell in the eastern mountains of Puerto Rico. The forecast models take the system either over the northern Dominican Republic or just offshore. It will make a huge difference on the track. If it stays offshore, we will probably be dealing with a hurricane in the Bahamas. Farther down the road, the models early next week move it up the Florida coast. One of the better models makes a landfall on the Georgia coast by the middle of next week.